One day, whilst perusing the internets and all the glorious splender that is on the webs I discovered Robicelli's. To be exact, I was looking around Medium and found some great posts by Allison Robicelli, specifically her write up on jogging. (Bob and I were joggers for a hot minute, now we are once again sloth-like.) I discovered I liked all her Medium posts, and immediately started to day dream about us being BFF - I know, super creepy, and yes I promise this post is about food. After doing my due diligence I discovered that my new girl crush BFF lived in NYC, and she and her husband make amazingly delicious cupcakes! I also discovered that the Robicellis were writing a cupcake book! I immediately jumped on Amazon and pre-ordered myself "Robielli's: A Love Story, With Cupcakes: With 50 Decidedly Grown-Up Recipes." I waited an agonizingly long time to receive my book, and in the mean time I managed to make it out to NYC to actually try a Robicelli's cupcake. It was worth it. Delicious. 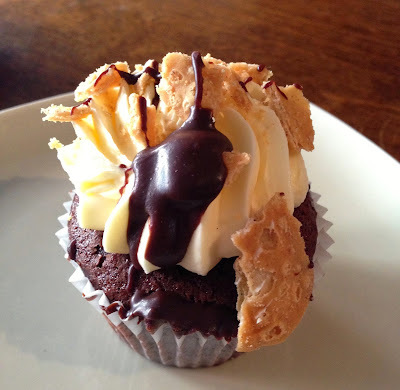 I had done my research and found a place called Cake Shop that carried the cupcakes and made sure it was the first stop on my list of places to visit. Chocolate cake, cannoli buttercream, cannoli shells, chocolate chips. Hands down one of the best cupcakes I've ever had, and it made me so excited to receive my new cookbook. And then finally, it arrived! I opened the book and was happily surprised to find that it's written colloquially. It's like Allison and Matt Robicelli are in my kitchen talking to me while baking. Their tips and tricks, as well as "half assed corner" are delightful and easy to read. It is hands down the most fun cookbook I own. I read through the recipes and picked my first cupcake...The Pumpkin Spice Latte. Mini Pumpkin Spice Latte cupcake with my awesome new book. After my lovely cupcakes came out of the oven I took to the Twitter-verse and shared my first batch with the world, and @Robicellis. I was quite pleased to discovered that @Robicellis is very active with their Twitter account and happily re-tweeted me. 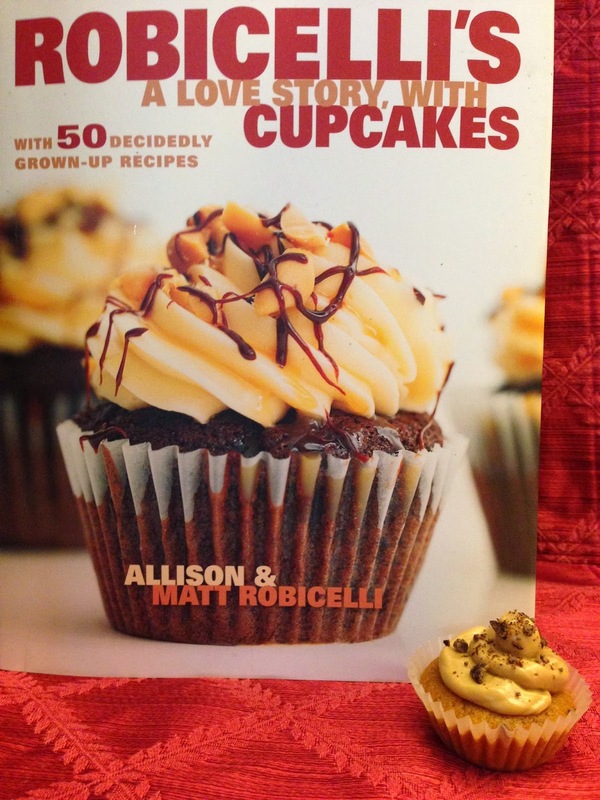 It was then and there that I decided that I would bake every single recipe from the Robicelli cupcake book. 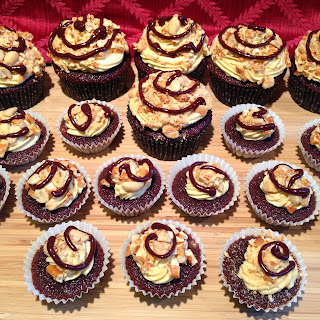 Chocolate Peanut Butter Pretzel Cupcake - Chocolate coffee cupcake with Peanut Butter Buttercream Frosting, and Chocolate Ganache. The Noah Cupcake - Apple Cupcake with Goat Cheese Buttercream Frosting, Bourbon Brown Butter Sauce and Candied Bacon. The Betty White Cupcake - Brown Sugar Sour Cream Cupcake with Cheesecake Buttercream Frosting and Lingonberry Jam. The Root Beer Float Cupcake - Chocolate Root Beer Cupcake with Vanilla Buttercream Frosting and a Root Beer Custard filling. The Liddabit Cupcake - Chocolate Coffee Cupcake with Salted Caramel Marshmallow Buttercream Frosting, topped with Salted Caramel Sauce and Peanuts. Each recipe is broken down into the different components of the cupcake. At the end of the recipe is a section called "Assembly" which is super helpful because it helps to finish off your cupcake and make it look amazing. 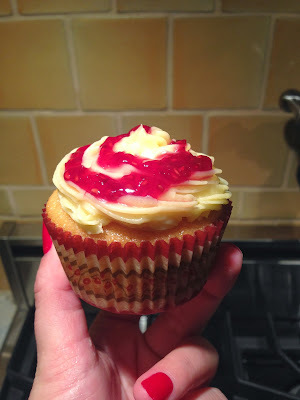 I've also discovered that the recipes work great for making mini cupcakes, which is my preferred size of cupcake. Each recipe makes two dozen regular cupcakes, and 48 mini cupcakes - just take 5 minutes off the bake time and you're good to go. I've started making the cupcakes in batches of one full size dozen and two dozen mini cupcakes. My personal cooking challenge to myself is to bake every single recipe in the book and tweet out the picture. I've already baked six different flavors and can hardly wait to bake more! Every few recipes I'll upload my pictures.